Cooper City Church of God will be celebrating Independence Day on Sunday, July 1st. We will have ONE Sunday worship experience at 10am. 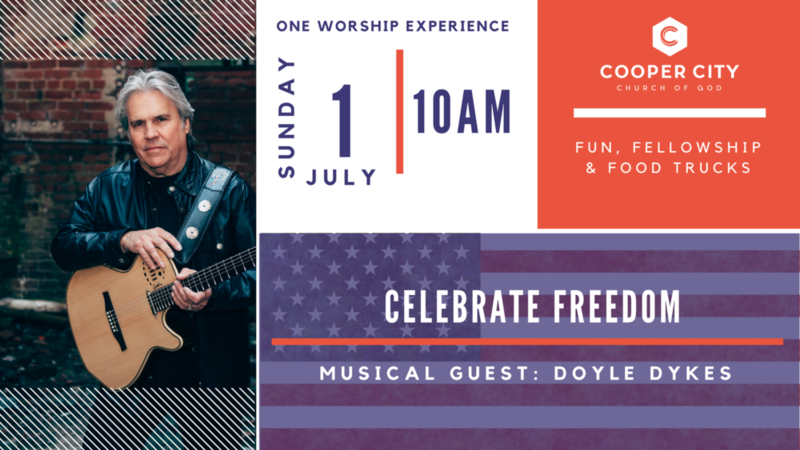 Special musical guest Doyle Dykes will be with us as we "Celebrate Freedom". THEN, immediately following the our worship experience we will have fellowship and food trucks. Food trucks will feature cuisines such as tacos, bbq, Caribbean and even ice cream! Don't miss a day of celebration and fun. Make sure to invite your family, friends and neighbors. Nursery and Preschool available for children 5yrs old and under.